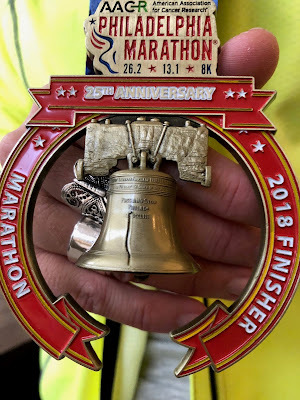 I'm sure you are all just sitting around waiting, breathlessly, for the race recap from My Musician and I at Runner's World Half Marathon and Festival and for my Philadelphia Marathon. I am working on them and unfortunately they may not get done till after the first of the year. But to tide you over till I finish the posts, I have some exciting running news. My Musician and I have finally succeeded in registering for RRCA Coaching Certification Course. I literally (and yes, I do mean literally!) have been stalking the page for over a year. I have had the tab open on my laptop, my phone and my iPad since Spring, checking it almost daily (while proofreading this, hubs said it was more like 10x's a day), hoping to get into a fall class. Of course the classes that we could attend, filled up immediately and the ones that didn't fill up in one day, seemed to fall on all my major race days. December 3rd started like every other day. It was a Thursday, so after getting Tink on the bus, I paid bills and went grocery shopping. My Musician texted me when I had just gotten home and said, "Have you checked RRCA lately?" Well, of course I have, just yesterday but with all my groceries sitting in bags on the floor, I opened my iPhone and looked. I almost passed out from the rush of excitement when I saw a large list of available classes especially since they hadn't yet sent out the notifications that there was a new listing. Me, I wanted to head right to the west coast to take a class, anything to get to California again. Thankfully My Musician is much more practical than I am. We talked about the distance of each class, the possible weather effects and the ease of getting a sitter for Tinkerbell. We finally settled on one within driving distance of us, in the early spring. I seriously can't wait till we go. It's something that I've wanted to do for a long time and to be so close to fulfilling this dream has me feeling like a little kid waiting for Christmas. Plus being able to work with my hubs, as a team, just fits for us so perfectly. We both have different strengths that together, I'll believe, we'll be a great coaching team. 2016 is shaping up to be another exciting running year for us. I really look forward to not only continuing to work towards my personal running goals, but also working with My Musician to create our own coaching business.